A slip of a girl faced one of Israel’s most feared war machines in the Occupied Palestinian Territories–the armed bulldozer–and died. This deliberate killing was no accident. Maybe the Israeli authorities would have preferred it not to happen because of the public relations backlash, but the driver of the bulldozer was wielding power that day. He had a mandate from his government to clear Palestinians out of their homes at a moment’s notice and he knew that he would be protected regardless of the crimes he dared to commit. Rachel Corrie was a US citizen, but even the US government closed ranks behind Israel and the bulldozer operator. Being an American did not protect Rachel, and four years later, the US administration still refuses to investigate her death denying her American family justice and closure. The bulldozer killing of Rachel Corrie was not the only case of such a death in Palestine, but it was the first time a US citizen had become the target of Israel’s military. Rachel was a peace activist who had gone to Rafah in Gaza because she wanted to help bring the terrible plight of the Palestinians to the notice of the world. With others in the International Solidarity Movement (ISM), she believed that non-violent resistance was a means of doing that, and tragically, she achieved that with her death more than she could have ever done with her life. Rachel was one of hundreds of foreigners who work as human shields in the Occupied Palestinian Territories–dedicated men and women committed to social justice who are seeking to keep the lines of communication open with the outside world while Israel is doing everything to close them. Rachel was trying to stop the bulldozer from demolishing a Palestinian physician’s family home–one of thousands that have been demolished for Jewish settlements and to make way for the Separation Wall. She wore an orange safety flap- jacket with reflective stripes, and photos clearly show her holding a megaphone. According to witnesses, she was talking to the driver and he knew that she was there. But, that did not stop him from pushing the dirt up against where she was standing into a mound with his blade and as she fell, he drove the bulldozer over her, reversed the killing machine, and ran over her again. Israel’s investigations cleared itself of any wrongdoing: Rachel was not run over by the bulldozer, “but rather was struck by a hard object, most probably a slab of concrete, which moved or slid down while the mound of earth which she was standing behind was moved”; the driver of the bulldozer had a “blindspot” and could not see Rachel in front of him; the soldiers who should have been flanking the bulldozer were called away to deal with another emergency; the Israeli army had not intended to demolish the physician’s house, but was only looking for explosives in a security zone; the peace activists “were acting very irresponsibly, putting everyone in danger–the Palestinians, themselves and our forces–by intentionally placing themselves in a combat zone”; the Israeli army was not guilty of any misconduct, and therefore, was not responsible for Rachel’s death. Only days before the Israeli findings were reported, another peace activist working with the ISM, Tom Hurndall lay in a London hospital with severe brain damage after being shot in the head by an Israeli soldier as he tried to protect Palestinian children from Israeli sniper fire being shot over their heads. Other internationals shot and killed by Israeli soldiers were: German doctor Harald Fischer, Italian cameraman Rafaeli Ciriello, British United Nations worker Iain Hook and British national James Miller. As for the Palestinians, more than 5,050 Palestinian men, women and children have been killed by Israeli troops and Israeli settler paramilitary units since September 2000. It is important to put Rachel’s death in context. Without an understanding of the history behind the injustices being perpetrated against the Palestinians, Rachel’s act of courage cannot be understood. In her writings, she believed that good and decent people everywhere would also speak out and do something, if only they knew. The Palestinians are the victims of the longest occupation in modern history. From the time that Israel was created in 1948, Israel intended to rid itself of the Palestinians. It was not a land without people like the myths and propaganda would have us believe. At that time, Palestinians were the majority population in cities, towns and villages and had been for centuries: their history goes back to time immemorial. But after World War II, the world decided to carve up Palestine and give the greater share to the Jewish refugees from Europe on the basis of a religious claim and out of guilt for what they had endured as victims of the Holocaust–a ghastly crime against humanity that had nothing to do with the Palestinians. Unwilling to accept the injustice of being “given” 47% of their homeland, the ill-equipped Palestinians, and backed by neighbouring Arab countries, found themselves fighting a war with the new Israeli army equipped and backed by the world powers. The ethnic cleansing campaign Israel had already begun in villages and towns caused many people to flee as the horrors of massacres reached them. No one who left thought that it would be permanent, but 750,000 Palestinians found themselves refugees living in tents in neighbouring countries with no attempt made by Israel to redress the catastrophic loss of their homes and their homeland in almost 60 years. By the time the 1967 war happened, Israel was firmly entrenched in the consciousness of the world and its absolute victory was so astounding that the plight of the Palestinians was drowned in the hubris. A new generation of refugees had fled their homes and those who remained–in Gaza, the West Bank and East Jerusalem – came under Israeli military occupation. This occupation has continued for forty years, and, in outright violation of international law, Israel has been appropriating more and more land that was intended for a Palestinian sovereign state. It is important to understand just what the Palestinians have lost and are continuing to lose despite the talks of peace, the peace process and now the Road Map. Not only has Israel been completely intransigent in these negotiations, the US has not been an honest broker, constantly demanding the Palestinians to rein in violence while allowing Israel to violate every single aspect of Palestinian lives and doing nothing to stop Israel’s illegal land grabs and illegal settlement building. The peace plans have masked Israel’s true intent, which is to take all of Palestine. Under the Oslo Agreement in 1993, the Palestinians had their land reduced to a mere 22% of their original homeland and the Palestinians accepted that in the hope that they could finally have a state of their own. But that was an elaborate peace plan drawn out over years and in reality gave the Palestinians a piecemeal sovereignty and no borders that they could control. In 2000, Israel’s Prime Minister Barak offered them an outrageous 80% of the 22% under what is famously known as Barak’s “Generous Offer” and the Palestinians have since been severely castigated for refusing to accept it. Sharon then came along with his “Peace Plan” in 2002 and offered the Palestinians nothing more than had been offered by Barak, but the media spin encouraged everyone to wait in anticipation. The disengagement from Gaza that followed and was so enthusiastically hailed by the world was in fact nothing more than a distraction from Sharon’s land theft and furious settlement building in the West Bank while Gaza became the world’s largest open-air prison, totally isolated from the West Bank and the rest of the world. Today, the Palestinians are left with barely 7% of historic Palestine and a totally fragmented 7% at that. The Separation Wall that went up in 2002 on the pretext of Israel’s security has been shown as just another tactic to appropriate land, to further fragment what is left to the Palestinians, and to destroy the economic and cultural life of Palestinian communities and families. In effect, Israel is unilaterally setting its own borders, and at the same time, is herding the Palestinians into the squalor of prison-like ghettoes without access to water or the fertile lands that sustained their farming communities for centuries. Not content with forcing the Palestinians into this no-man’s land of 700 kms of wall, over 500 checkpoints, and constant military surveillance and intimidation, Israel is also manipulating some of the most malevolent charades designed to ethnically cleanse the Palestinians from the land. It decides on who can come and go and who will get permits to visit from abroad with family reunification and re-entry being denied in alarming numbers–spouses are being separated, children are being forced to live with one or other parent or relatives, sick people cannot seek medical treatment overseas, academics cannot take study leave, and investors, professionals and tourists are being stopped from entering. Over 60,000 foreign nationals with a Palestinian heritage or married to Palestinians live in the occupied territories on tourist visas and are being denied re-entry when they leave to renew them every three months. Those who cannot afford to leave become illegal residents and are deported if caught. These were people who encouraged to come after the Oslo Agreement to re-build Palestine. Palestinian state is being systematically de-Arabised through a complex system of manoeuvres under the pretext of urban planing and expansion. Building permits are rarely granted to Palestinians and by restricting movement, Israel can confiscate property under the law of absentees. And, although Jerusalem has an internationally recognised special status allowing all religious denominations free access to its holy places, Israel has denied access to Palestinian Christians and Muslims in their own city: it is becoming increasingly clear that Israel intends to make it a city and a state for Jewish citizens only. Against this background, Rachel Corrie came to Palestine as part of an international movement which realised that Israel was creating an apartheid state out of occupation. Never has a state that describes itself as a democracy so cruelly oppressed and imprisoned a whole people in their own land in total breach of international law, all international conventions and umpteen United Nations resolutions. The full horror of Israel’s practices have left many a visitor in shock and few can forget what they see. Rachel wrote stunned about her experiences in her emails home and her words continue to haunt those who hear them. Little would she have realised when she wrote these words that they would have the power to move people to action, so much so, that the play “My name is Rachel Corrie” had sell-out performances in London, and last year, was spectacularly banned in New York. This year, Israel’s military occupation will have been ongoing for forty long years. Home demolitions are just one of the many ruthless and violent measures used by Israel to terrorise an already terrorised people. They are a clear violation of international humanitarian law. Since 1967, Israeli bulldozers have destroyed more than 11,000 Palestinian homes, injuring, killing or leaving homeless, thousands of individuals in the process. In Rafah, the homes that were bulldozed stood in the way of the Separation Wall that was being built between Rafah and Egypt, and along with the family homes, greenhouses, mosques, schools and shops were also destroyed. Today, the neighbourhood in Rafah where Rachel stayed is entirely gone. In one midnight attack, only five out of 30 homes remained standing. The house that Rachel Corrie had been trying to save has also been completely demolished. Israel’s home demolition policy is just an extension of Israel’s plan to displace or transfer the Palestinian population. Already, some 80% of Palestinians have been pushed out of Israel. In the occupied Palestinian territories, more than half of the Palestinian population is being forced to live in the shanty-towns deliberately created by Israel. It is impossible to imagine the trauma of seeing one’s family home demolished and all one’s belongings ground into the dirt by the bulldozer: seeing it happen to someone else is bad enough. Rachel Corrie would have seen it happen many times. But that day, the house that she was protecting was the home of a family that had opened its doors to her and where she had been staying. The bulldozer arrived without warning. In many cases, the family are only given an hour at the most to remove their belongings and if they protest, they are forcibly removed, and if they protest too much as they watch all that they have worked for and probably all they own, being ground into nothing, they are beaten, jailed and even killed. This day, Rachel was killed for protesting non-violently. Rachel’s family is still searching for justice four years after her murder. No independent inquiry has been carried out in the US and it seems that while the FBI is supposed to carry out an investigation, it does not have any files on Rachel Corrie. US Representative Brian Baird did introduce a bill in the US Congress just a week after Rachel’s death calling on the US Government “to undertake a full, fair and expeditious investigation”, but no action was taken or has been taken since, despite 56 House members signing the bill. This official silence surrounding Rachel’s death is disturbing. When three Americans were killed in Gaza supposedly by Palestinians, the FBI were on the scene within 24 hours. With Israel and US closing the case which such finality, Rachel’s parents turned their attention to Caterpillar Inc, the corporation which manufactures the bulldozers used by Israel in its illegal demolitions. They filed a lawsuit claiming that their product violates international law, but this was dismissed by a Federal judge in November 2005 and he ruled that Israeli law offered adequate available remedies. Of course, Israel had already exonerated itself and no remedies are available to Rachel’s parents. They have since appealed the decision. Blaming the victim is the way Israel and its supporters operate. Not a modicum of humanity for the Palestinians and nothing for those who dare to take up their cause. A vindictive campaign by Israel’s supporters continues to dog the efforts of Rachel’s family to expose the lies and distortions of the truth about Rachel’s death. Promises of a transparent investigation never eventuated and only two American Embassy staff members in Tel Aviv and Rachel’s parents were ever allowed to “view” the full document. It prompted Richard LeBaron, US Embassy Deputy Chief of Mission in Tel Aviv, to say that “there are several inconsistencies worthy of note”. If this is the way an American citizen is treated, one has to wonder how many other crimes are being treated as mistakes or the fault of the victim? And, how many excuses can continue to exonerate Israel from the crimes that are being committed every day? It is about time that Israel’s crimes are recognised for what they are. Israel kills Palestinians deliberately­ women, children, old men, young men – decent, honourable, innocent people who go about their ordinary everyday business are being made to suffer collective punishment for anyone who dares to resist the Israeli military–with guns or in peace. Of course there are Palestinians who are fighting, just like the French resistance fought their German occupiers and just as it is the right of any people to fight those who oppress them. Resistance, as a last resort, is enshrined in the Universal Declaration of Human Rights and is a right under the UN charter’s Article 51. But Rachel Corrie did not come to fight with guns. She came to resist non-violently; she came in peace. The highly politicised nature of the conflict and the fact that Rachel Corrie was American has ensured that the controversy of her death continues. Rachel’s courage was perhaps born out of the idealism of youth, but it was a courage far greater than nations with bombs and arms and power to wield who have failed miserably to hold Israel accountable for the war crimes it has perpetrated against the Palestinians over decades of brutal occupation. For this reason, Rachel Corrie will always be a symbol of acting out truth to power in the struggle for Palestinian liberation against the Israeli occupier and a world long desensitised to the immorality pervading the corridors of power of all governments. You will be remembered forever, Rachel and we hope that out of your tragic death will come a better understanding of the inhumanity gripping our world and what we have to do to bring compassion and justice back into our consciousness. Palestine has waited a long time and Palestine deserves some human kindness in its 40th year of occupation. 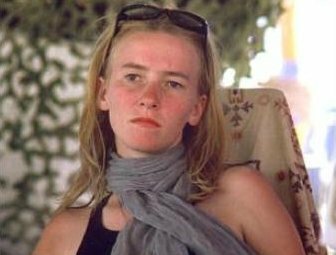 We have no doubt that Rachel Corrie would have campaigned for that too: we feel her spirit with us as the struggle goes on.